Posted by Morgan in clinton, oilsands, state department, tcktcktck. Many of you saw the letter the Action Factory wrote yesterday in response to the State Dept approval of the Clipper Pipeline border crossing. Today we met with two officials with the Oceans, Environment and Science department, one of the departments that worked on the Clipper pipeline project. While the officials avoided giving us their names or positions, we imagine that one works in PR while the other is more policy focused. They thanked us for our wonderful visual skits and the over 10,000 phone calls and emails Avaaz.org generated. They emphasized that we should have gotten involved earlier, during the public comment part of the two year process, where over 6000 stakeholders submitted their opinions. The PR guy emphasized that the US plan to reduce oil emissions centers around CAFE standards and what a great improvement we’ve had in that area. He said that we should bring the Tar Sands Monster skit to an Escalade factory if we really want to make a difference. The woman, who was sorry to have missed the skit, said that the next pipeline project has already started the approval process, and they expect the public comment period to be open in December or January. They both also pointed out that their role was more approving the crossing of the U.S. border, but that there were various other regulatory agencies that needed to sign off on the pipeline as well. Posted by Morgan in clinton, oilsands, state department. The decision sat on Clinton’s desk for months, and with a stroke of the pen, she could have denied this expansion of dirty energy infrastructure. But today, the State Department issued the permit, committing the US to more CO2 emissions from oil, and committing Canada to more destruction of indigenous lands and Boreal forest. We brought the Tar Sands Monster to Clinton’s doorstep, generated thousands of phone calls and emails, but Clinton failed to make the right decision. After considerable review and evaluation, on August 20, 2009, the Department issued a Presidential Permit to Enbridge Energy, Limited Partnership for the Alberta Clipper pipeline. The State Department will continue to work to ensure that both the United States and Canada take ambitious action to address climate change, and will cooperate with the Canadian government through the U.S.-Canada Clean Energy Dialogue, the pursuit of comprehensive climate legislation, the United Nations Framework Convention on Climate Change and other processes to reduce greenhouse gas emissions. Posted by Julie in climate refugees, clinton, copenhagen, state department, tcktcktck. Yes, the Senate can pass a clean energy bill that is Harder, Better, Faster, and Stronger than the house ACES bill. We just have to teach our senators the 5% Allocation Workout routine, and they’ll buff up the bill in no time. Yes, President Obama can go in person to Copenhagen and raise the stakes at the negotiating table. It will even be fun and he can enjoy himself by eating danishes while in Denmark for the UN talks. Climate change is complex and it’s difficult to talk abut complexity in today’s news media, so we at the Action Factory have mostly stayed away from communicating much about the complexities of climate change in our actions. Instead, we’ve dumbed things way down for the sake of getting attention and keeping an up-beat ton. This has been very effective and I’m glad that through our actions we’ve gained a reputation for being optimistic and hopeful — because we are. And yet, it is important to step back every once and a while and remember another dimension of this battle. Our tone of optimism about fighting climate change often includes a mouthful of intangible jargon while leaving out an explanation for why we need a fair, ambitious, and binding global climate treaty so urgently. Climate change is not only a great opportunity to create jobs and new prosperity. It is also an urgent crisis that is already impacting many individual human lives and perpetuating current injustices. 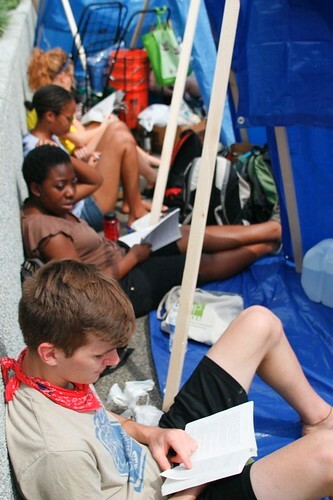 This week the Action Factory struck a new tone by setting up a refugee camp outside the state department. With our makeshift tents, blue tarps, and a reasonable ration of food packed in cardboard boxes, we put ourselves in the shoes of people displaced by climate change for over 24 hours. Our action gave us a brief taste of what it must have felt like to be Katrina climate refugees forced to leave their flooded homes. It allowed us to empathize ever so slightly with Sudanese refugees who have no choice but to flee from the violent Darfur conflict, which has it’s roots in drought caused by climate change. We attempted to put ourselves in the shoes of Alaskan villagers forced to relocate as the permafrost that used to support their houses thaws, and try to understand the plight of Carteret islanders who have no choice but to leave their homes because growing crops has become nearly impossible with increased storm surges attributed to climate change. It was hot, exhausting, and uncomfortable. I lay on my back awake on the pavement at 4:00 am and longed for my bed at home or even a light blanket to protect me from the early morning chill. And yet, of course, I had it easy, relatively speaking. I was a ‘refugee’ for a mere 24 hours, and within walking distance of air-conditioned shops where I was able to take time-outs for cold water, coffee, snacks, and other amenities. Posted by Morgan in climate refugees, clinton, state department, tcktcktck. I knew it would be hot and humid during our 24-hour campout in front of the State Department, but the utter devastation of the DC summer always manages to surprise me. What keeps me going is thinking about the millions of real climate refugees out there who don’t have the luxury of taking a break to get a cup of coffee in an air-conditioned café. Also, we’ve been received really well here, which is invigorating! When we set up camp 50 yards from the State Department staff entrance at seven o’clock this morning, there was the usual kafuffle with the police arriving and trying to figure out what they could kick us out for. When they found nothing (except for lowering the tops of our makeshift tents to make us look less like we’re camping), they backed off and those that stayed became very friendly and have just been spending the day with us. Even later, when an employee from inside the building called the police asking them to remove us, they came over here and told us that we were doing nothing wrong and to keep up the good work! Most employees walking by have been very receptive though, and we ran out of our 500 flyers within the first three hours because everyone was so enthusiastically taking them. We’ve gotten lots of smiles, a few peace signs, and just generally feel pretty appreciated which really helps motivate us to keep going. When we went inside to deliver a letter with our message, a representative from the office of Todd Stern, the US leading climate negotiator for COP 15, came down to talk with us. She said that they recognized us from our previous actions (Clinton’s Big Decision on Tar Sands and Todd Stern Needs High Fives) and that they’re happy we’re here. Another lady walking by let us know that she works closely with Stern’s office and that they know we’re here, they know our message, and they appreciate our work. Even just this much would have made it feel worth it to me, but then the press started to arrive. We staged an informational interview about climate refugees for CNN, cleanskies.tvnews, and Local Channel 9, who covered our entire action with three huge cameras on tripods. I’m looking forward to seeing what kind of coverage comes out of that; I really hope this issue gets some of the recognition it deserves. Please keep following us on twitter @actionfactorydc and watching our blog for updates, because we’ll be here all night. As one passer-by advised us, we’re sticking around and not cutting them any slack! Secretary Clinton, be a leader! 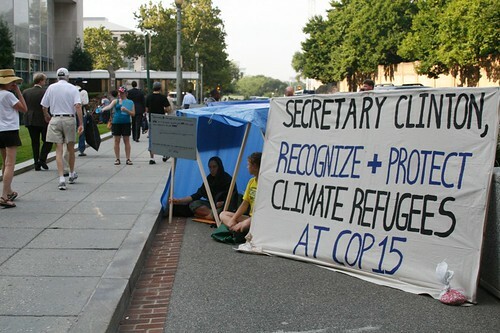 Recognize and protect climate refugees at COP15. Posted by Morgan in climate refugees, clinton, tcktcktck. It is important, then, that we stand in solidarity with these many millions, and bring their voices to the policy-makers whose decisions will ultimately shape their future. Such action is desperately needed, yet our leaders typically fail in recognizing climate refugees altogether. In high-level talks regarding climate refugees, decision-makers find themselves bogged down in determining even the basic definition of climate refugees (see Morgan’s post from last night). It appears that after so much politicking over semantics, world leaders are simply too exhausted to take real steps toward aiding these involuntary migrants. But according to the International Federation of Red Cross, climate change disasters are currently a bigger cause of population displacement than war and persecution combined: current estimates of the number of climate refugees range from 25 to 50 million worldwide, compared to the official refugee population of 20.8 million. World leaders claim that they do not want to complicate the word “refugee,” as if they worry about sullying the term for political exiles. Call them what you will, climate refugees are very real; their stories are harrowing, and their numbers are rapidly growing. The Intergovernmental Panel on Climate Change (IPCC) predict that there will be 150 million climate refugees by 2050. Posted by Morgan in climate refugees, clinton, copenhagen. Climate change is forcing people to leave their homes, and even forcing entire nations to sink beneath the waves. Yet climate refugees might not even be included in the international climate agreement being developed for Copenhagen. At last week’s Bonn III negotiations (the talks to get ready for the big Copenhagen negotiations), the one line of text that referred to climate refugees was bracketed. That means the text is flagged for possible approval, instead of being firmly included. This slight change makes the US less responsible for the problem. The United States would rather not even use the word ‘refugees,’ fearing its strong implications, and instead would use the word ‘migrants.’ Why? Because a ‘migrant’ is someone who decides to move. Peoples’ homes are being destroyed. They are not going to be moving voluntarily, and any effort to make it seem like they are is a blatant shirking of responsibility on the part of American diplomats, most notably Hillary Clinton. Tomorrow morning, the Avaaz Climate Action Factory, in solidarity with climate refugees across the world, will erect a refugee camp right in front of the US State Department in Washington DC. 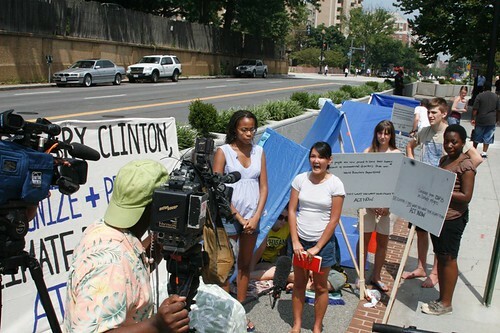 We will brave the 95 degree heat to demand that Clinton include language recognizing and protecting climate refugees in the negotiating text. Action Factory members are working for a global climate treaty that mitigates climate change and protects the world’s most vulnerable people. While major emissions reductions in the US remain probably the most important piece of that treaty, other important aspects can and should be advocated for in the run-up to Copenhagen. This includes provisions protecting climate refugees, increased funding for international adaptation, and more money for international clean-tech transfer. As we near the fourth anniversary of Hurricane Katrina, please help us spread the word about the State Department’s lack of protection for those who will suffer first and suffer hardest from a warming world.